These past few days we have experienced some serious humidity here in Massachusetts. Walking to your car in the blazing sun can be rough enough, and once you get there the inside of the car is usually hotter than it was outside. So how can you keep your car cool when temperatures are on the rise? An air conditioner is great once you are inside the car, but they do take a few minutes to kick in and keeping your car cool in the first place will make it much more pleasant when you initially begin your drive. There are plenty of accessories for cars that can help keep them cool, and luckily most of them are very affordable. Check out these following items that will definitely come in handy when it comes to beating the heat! Window Deflectors – Ever been stuck in a car with no air conditioner? That alone can be rough especially if you are sitting in traffic and there’s not much of a breeze. If it starts raining that can really make things worse, your choices are either get soaked with the windows down or swelter and stay dry with the windows up. Window deflectors, also known as rain guards offer the perfect solution. They stick to the top of car windows and prevent rain from getting inside the car even if you have the windows down. Prices vary based on the model of your vehicle, but most window deflectors range from $40-$70. AutoAnything is great site with many different options and they offer free shipping on 99% of their products! Since window deflectors vary in size and shape based on different vehicle models, it is unlikely that you would be able to find one in a store so this is a great option! Sun Shade – We’ve all seen cars with these gigantic shades across the windshield, and although they are kind of goofy looking, they really are effective in keeping the car’s interior cool. The best part? They are one of the most affordable things you can buy for your car, you can find them on Amazon for as little as $4.99! Amazon is a great site because they literally have everything you could imagine for sale and the products are constantly changing so there is always a new selection! Sizes can vary, so be sure to check which ones are available. Reading the customer reviews is a great resource because they will definitely give you an honest opinion and tell you the pros and cons of your potential purchase. There are also some custom sun shades available which are a bit more expensive but worth it if you want to ensure that your windshield is completely shielded from the sun. If you want to have some fun with your purchase check out the various colorful designs that are available as well! 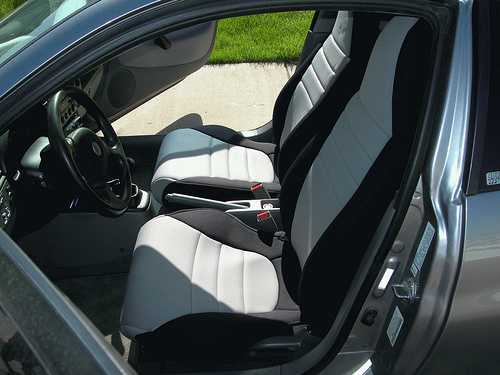 Seat Covers – Leather seats are considered a luxury, but sitting in a car with leather seats can be painful in the summer. Leather will get much hotter than velour seats, especially if it is black leather. A simple (and stylish) solution are seat covers! They last for years and come in various designs that protect the upholstery in your car while also preventing your legs from sticking to the seats! ShearComfort is a seat cover retailer where you can search for seat covers based on the make of the car or by style. You can have a lot of fun with the various designs and materials such as sheepskin, hawaiian, velour, animal print, and neoprene. All of their seat covers are custom and made from high quality fabrics. They are also washable and very easy to install without any special tools. This company has been in business for 29 years and guarantee the lowest price on their merchandise. Prices vary based on the vehicle but a pair of seat covers for the driver and passenger side is about $150 on average. Steering Wheel Cover – Similar to leather seats, steering wheels get extremely hot in the summer sun, sometimes so hot that it is painful to steer! Steering wheel covers are a great solution and not only are they perfect for summer, they are awesome for winter as well! They will keep your wheel cool in the summer and warm in the winter, and can be found for $15-$20 on average. If you are planning on getting seat covers, ShearComfort also offers steering wheel covers that match! If you already have velour seats and are just looking for the steering wheel cover, they have a wide selection of designs and patterns ranging from camo to animal print to sheepskin and hawaiian. Keep cool this summer and check out some of these products for your car, not only will they add some relief from the summer sun but many of them come in different designs that you can have some fun with! Avoid some real heat and make sure that your Massachusetts auto insurance policy is up to date as well! Call or click on MassDrive for a quote, we work with many major carriers in Massachusetts so you will be sure to get the best rate!